A little over a week ago, I attended Blogger Bash in NYC – a great 2-day event full of blogger goodness. One of the events during the 2-day affair was the epic Sweet Suite, from the Big Toy Book. 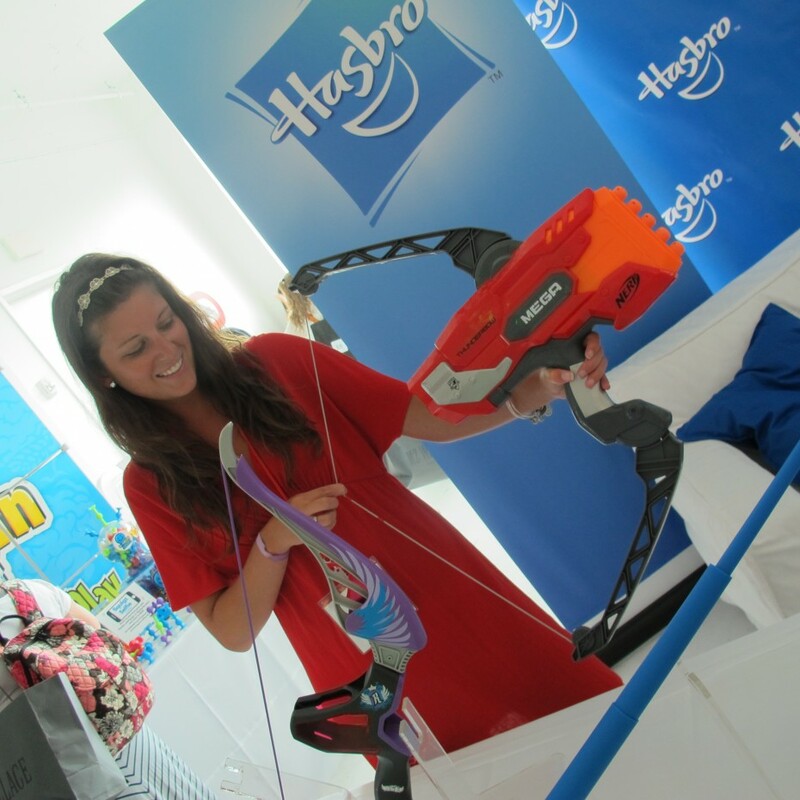 This event brings together bloggers and brands for a night of play – toy companies display their latest and greatest on the market and the bloggers get to act like big kids for an afternoon. 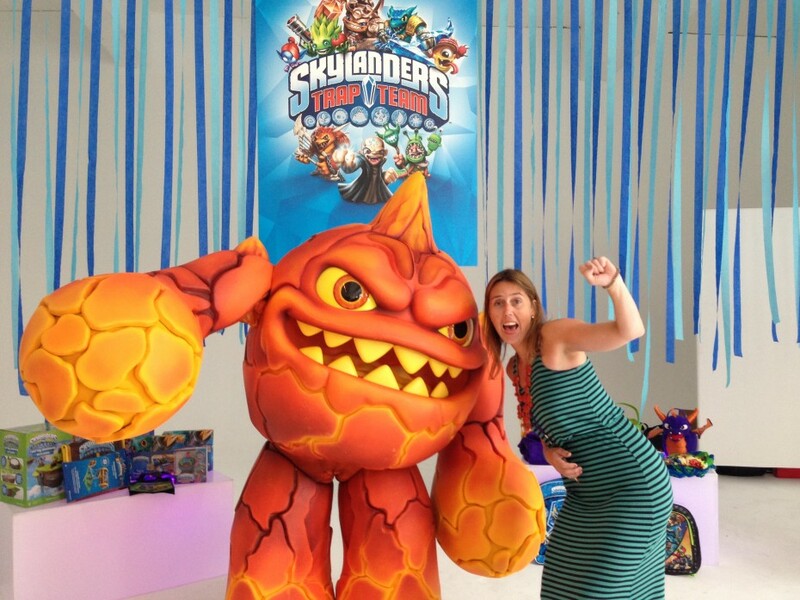 1) Skylanders Trap Team – can you tell we’re a Skylanders family? Skylanders will be releasing game #4 this October, Skylanders Trap Team, and it promises to be as fun as the first 3 games. The way I understand it, you have these crystals that you can “trap” the bad guys in. Somehow, you can turn the bad guys into good guys once you conquer them. 2. Goldie Blox – these are not new but it’s the first time I had seen this toy. Described as the “engineering toy for girls,” this toy reminds me a bit of Tinker Toys only it has more of a feminine flair to it. Love it. Did you know that worldwide, engineers are 87% male and only 13% female? 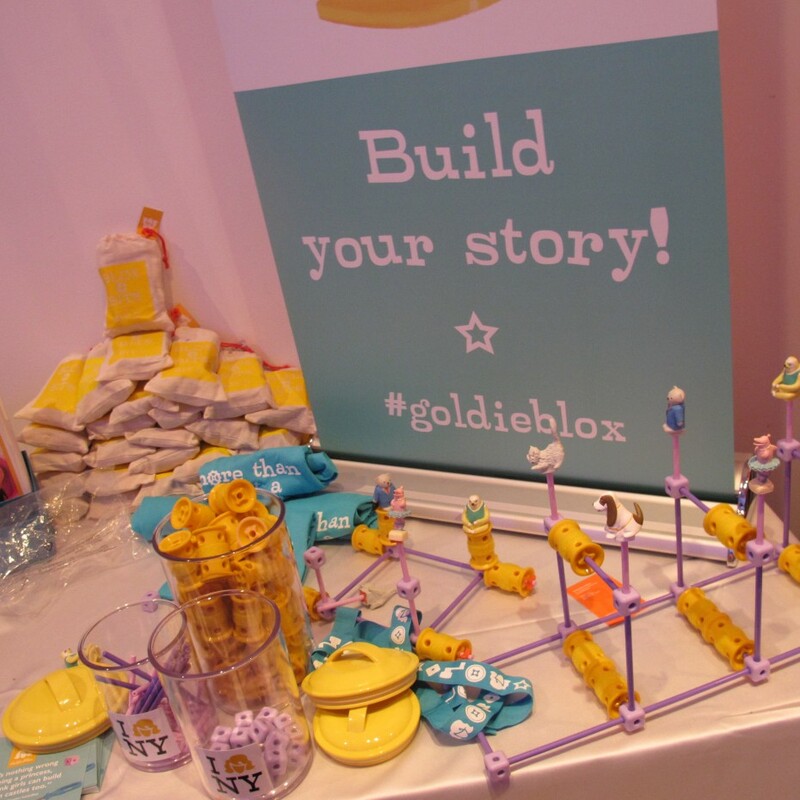 The mission of Goldie Blox is to get girls building at an early age. And how fun & engaging are these toys! 3. Nerf’s MEGA Thunderbow. People. The wars my boys could have with this toy in the house would be EPIC. Get the Nerf Thunderbow on Amazon for $39.99. 4. 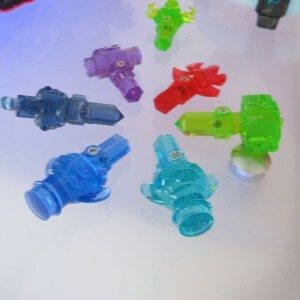 Fat Brain Toys Thunder Popper. There may or may not be a video of me attempting to ride the Thunder Popper after I had had some wine. Sadly, I couldn’t figure out how to download the Facebook video from my blogger friend’s page so you guys will just have to imagine the fun I had. (a lot of it!) It’s a combination of riding on a balance board and popping bubble wrap and oh-so-much fun. I may have to get this for my boys when Christmas hits. The Fat Brain Toys Thunder Popper is $36.95 on their website. 5. Wubble Ball. 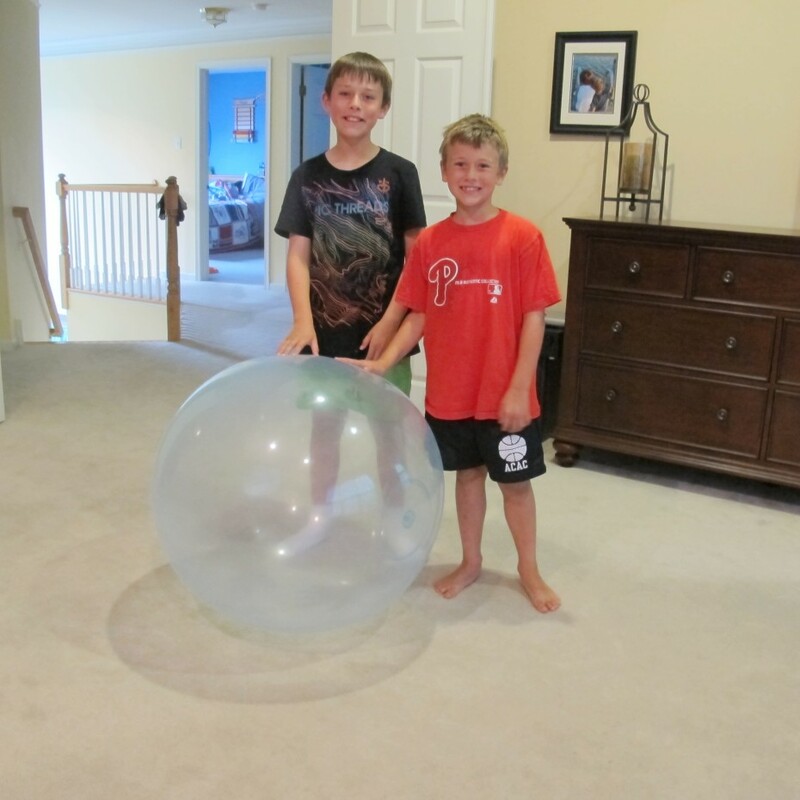 My boys have been having the BEST time with the Wubble Ball I brought home from NYC. I should note at this toy wasn’t at Sweet Suite but at another event hosted at the Blogger Bash, the EA Events party the next day. Still, it was a huge hit and I did a longer review last week that you can check out – there’s a video of my kids playing with it as well as details how to order. It’s a ball that feels and acts like a bubble. Simple, clean fun. 6. LEGO Batman 3. This game is so new, I can’t even find it on Amazon or online for you to pre-order but I can link you to the press release page on the LEGO website. 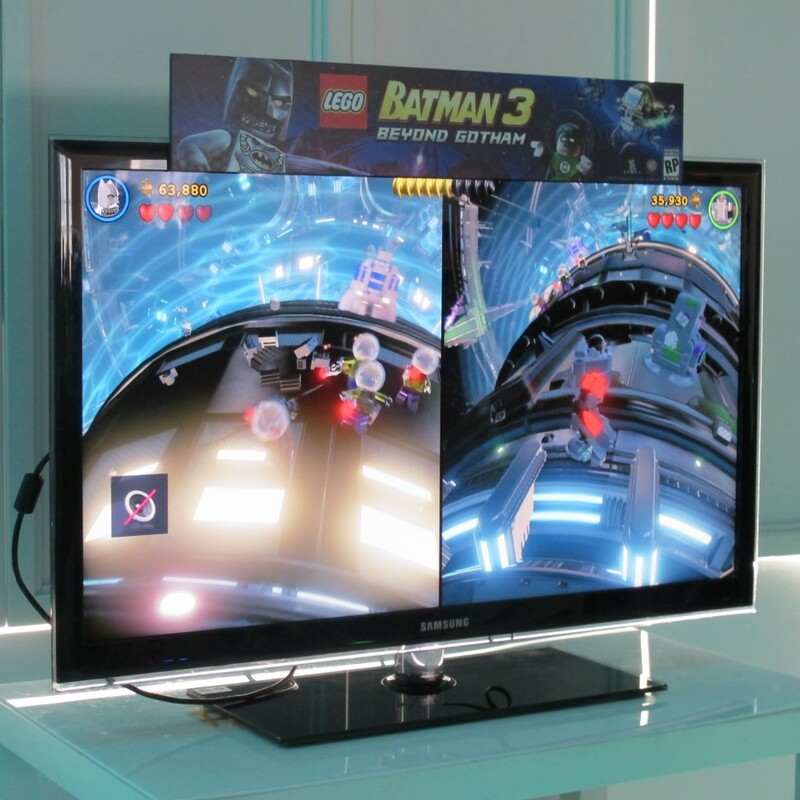 The latest in the series of LEGO games, this game looks amazing and has Batman in friends battling up in space! 7. Disney Infinity 2.0. 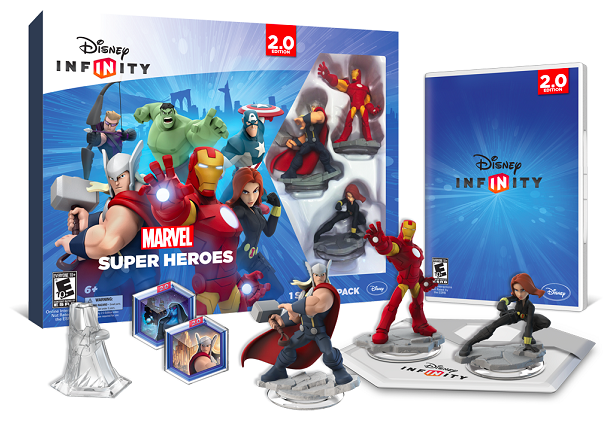 Disney’s second release to it’s widely-popular Disney Infinity game will come out on September 23rd and there will be Marvel Superheroes! Awww yaaah!! There will be other new characters too including Stitch and Tinkerbell. Keep an eye out for this one. 8. Kurio. I was able to demo the new Kuro Xtreme, a tablet for kids that has all sorts of kid-friendly add-ons like a motion sensor so you can play games like you can with the Kinect on the Xbox. 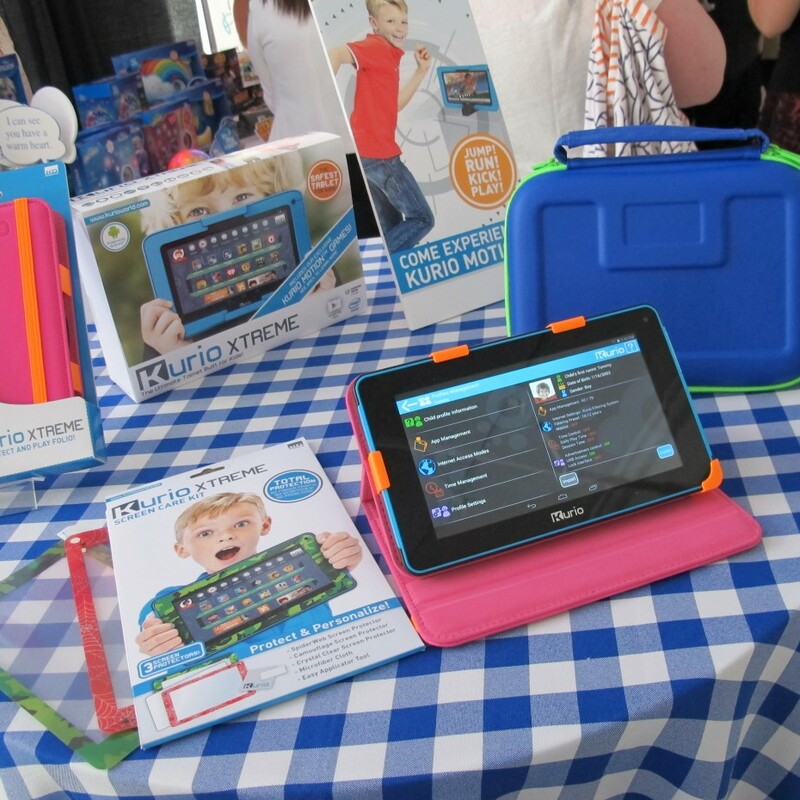 They are heavy on the parental controls which is fab since this is a family-friendly tablet. And also, a new phone for kids! I was particularly interested in this one with a 10 year old in my house. The phone is yet to be released but will also come with heavy parental controls so you can keep a handle on who your child is calling, who can call and text them. 9. 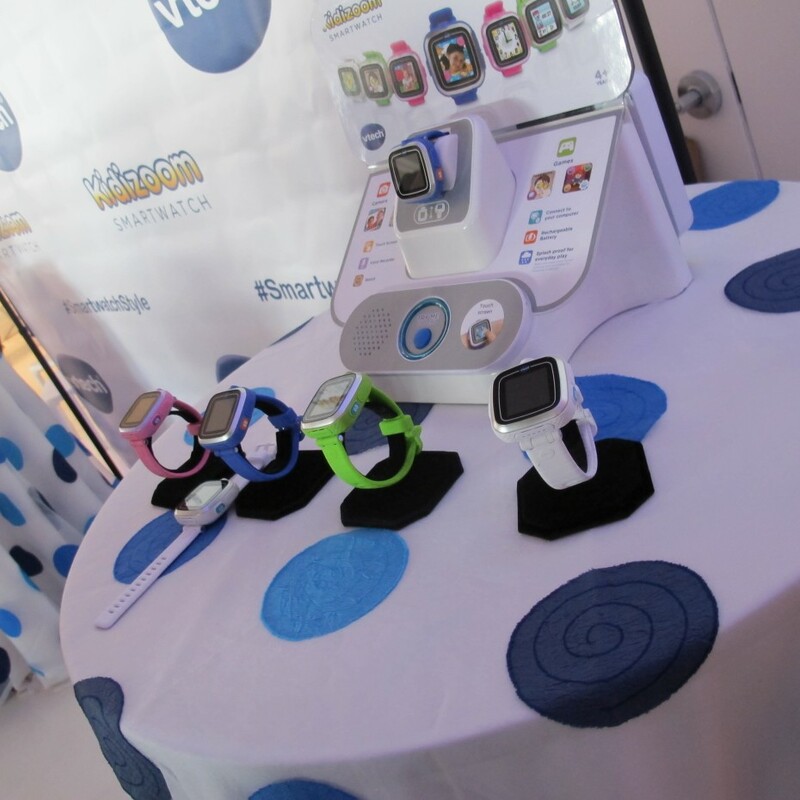 V-Tech’s Kidizoom Smart Watch. Kids can take photos, record video and tell time with this touchscreen digital watch. 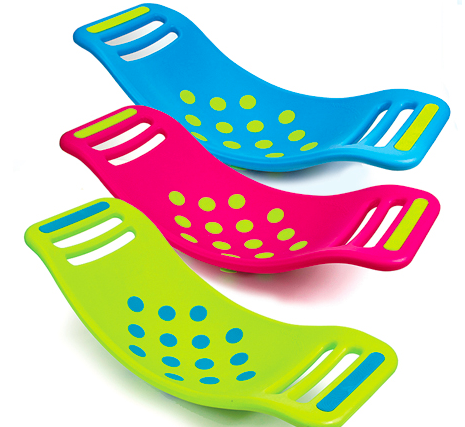 Get the Kidizoom on Walmart.com for $59.96. 10. Razor Scooters. I was impressed with the collection of updated products from Razor. My kids have a Flash Rider which is basically a tricycle on steroids. It goes extremely fast depending not he kid sitting down and you can spin the wheels so it does 360s which you are on it. My boys each got one for Christmas 2012 and they are still the most popular toys in the neighborhood. We often have up to 10 kids waiting in front of our house to take turns to ride on ours. The latest version of the Flash Rider is the Power Rider 360 which is motorized and I was pleased to see the options for little guys too. See the latest on Razor.com. 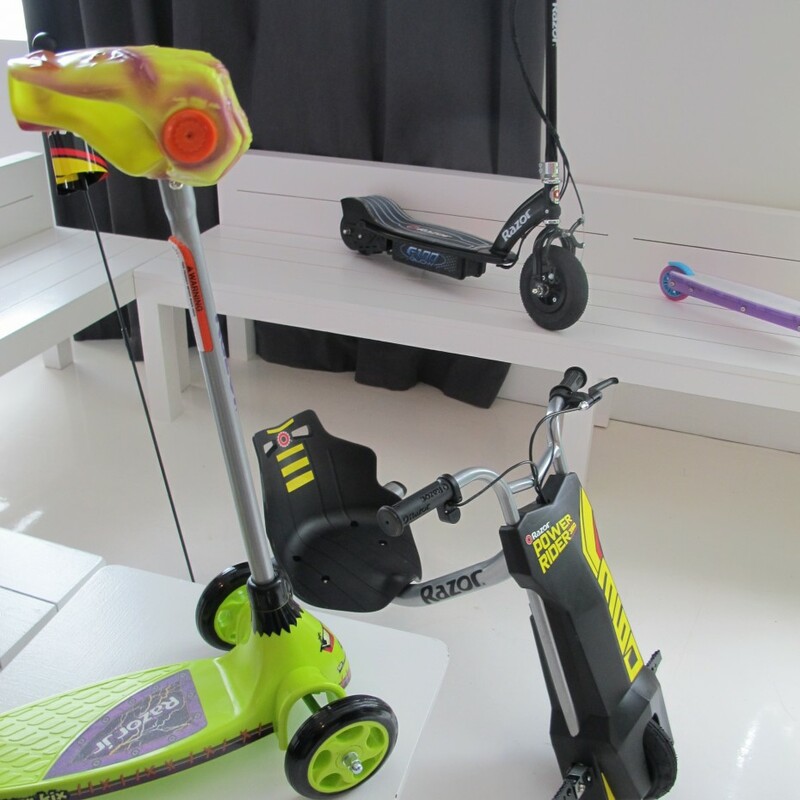 We really loved the Vtech Kidizoom, Wubble Ball and the light up Razor scooter, too. And the video of you riding the Thunder Popper was pretty funny! haha thanks Heather – I had so much fun riding it!!! The dude ask me daily how much longer until Trap Team is released. Ha!